More than 30 years after he graduated with a Master of Performance degree from the NIU School of Music, Jim Roberts was back on campus for a visit, interacting with NIU students and faculty, and reflecting on how his time here guided his career. Roberts is an accomplished percussionist, producer, artist and educator who has performed, taught and studied all over the United States and the world. Roberts earned his undergraduate degree from East Carolina University in music education. His arrival at NIU came after a slight detour. Holly had gone to ECU to study under Harold Jones, the chair of the instrumental department in percussion. He also talked about the influence that NIU professors Al O’Connor and Robert Chappell had on exposing students like him to other forms of percussion. “Thanks to Al and Robert Chappell I joined the steelband, and I had no idea what steelband even was,” he said. “That’s when my eyes opened to the fact that there was something besides snare drum, marimba, timpani, multi-percussion and marching percussion. It began my great education that continues to this day. 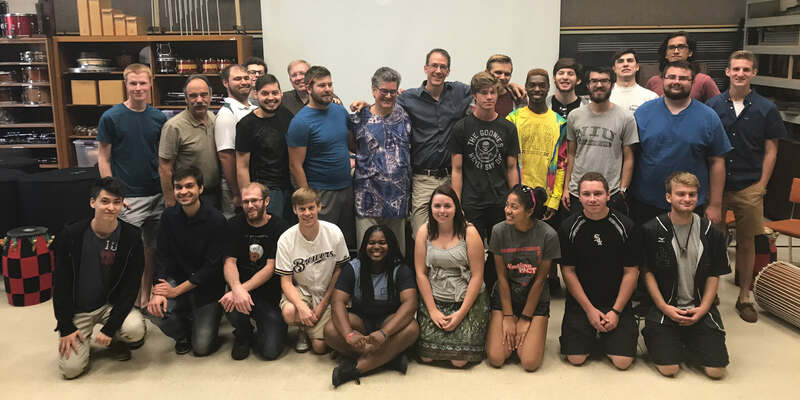 Though his visit was short, Roberts sat in on rehearsals and lessons and got a chance to talk to a class taught by Greg Beyer, NIU professor and head of Percussion Studies. Roberts has been on the faculty at Elon University in Elon, NC, since 2007. He also directs the Elon World Percussion Ensemble which he started in 2008.